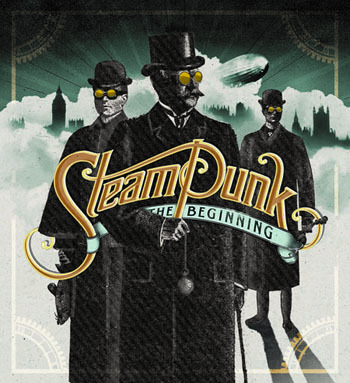 Steampunk is odd: Mechanical humans, dirigible airships flying over London and Victorian-era Englishmen wearing monocles and fighting with futuristic contraptions. Steampunk, a speculative science-fiction subgenre, reimagines 19th century history and technology. Its presence in Hugo, Doctor Who and The Golden Compass has made it mainstream in recent years. But not many people know that Steampunk has its origins at Cal State Fullerton. “Steampunk: The Beginning,” at CSUF’s Begovich Gallery (located in the Visual Arts Building), examines the genre with artwork based on Steampunk novels by three Titan alumni published in the ‘80s: Homunculus by James Blaylock (B.A. in English ’72, M.A. in English ’74), Infernal Devices by K.W.Jeter (B.A. in sociology ’73) and Anubis Gates by Tim Powers (B.A. in English ’76). Steampunk was actually coined by Jeter in a 1987 letter to Locus, a science-fiction magazine, referring to steam-powered inventions of the 19th century. The exhibit features 91 pieces of artwork by 33 students, faculty and alumni. It opened Saturday and runs until May 10. The clear standout is “The Paganini” (2012) by Douglas Sirois, a digital print on aluminum. It is influenced by Jeter’s Infernal Devices about a man living in Victorian England who discovers his father has created a mechanical clockwork human. The illustration masterfully portrays a Victorian, complete with a bow tie and top hat, who is grinning while tearing apart his shirt to reveal clock pieces in a green glow. The color, detail and the character’s expression solidify it as the gallery’s masterpiece. Cliff Cramp wore his Steampunk best, including a bowler hat and goggles, to the opening reception, and produced 13 pieces for the exhibit, including a memorable portrait of the three authors dressed as Steampunks. “Really this show is about Fullerton illustrators celebrating Fullerton authors,” said Cramp, an art professor and coordinator for the illustration program at CSUF. Most of the artwork are digital prints or illustrations, but one piece, in the back of the gallery, is a welcome surprise. “Jacky ‘Hunts’ Dog Face Joe” (2012) by E.J. Reimer is a photoshop piece of a woman holding a pistol. The eerie background and digital screen give the impression that the viewer is watching a mini 3D movie. 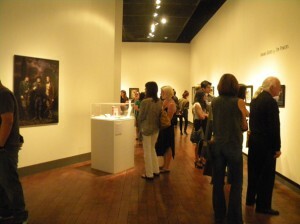 The gallery has two rooms and a clean layout. The collection fits the Steampunk mood of futuristic cities and dirigibles flying over London by having clock motifs and gray and brown color themes. A TV screen in the back will be used to show a conversation, which took place Saturday, between Powers, Blaylock and Mike McGee, director and curator of the Begovich Gallery, about their books and the art. “It’s great to see the creative talent that we have here (at CSUF),” said McGee, who has done over 500 exhibits since the late ‘70s. Blaylock said he enjoys being able to see drawings based off his novel more than two decades after it was written. “It’s wonderful. It’s actually the coolest thing I’ve done in a long time,” said Blaylock. After a long absence, he returned to writing in the Steampunk genre in 2008, and his newest Steampunk novel, The Aylesford Skull, comes out in January 2013. But Blaylock’s literary history at CSUF goes beyond his novels. He and Powers created a fictional poet named William Ashbless to write poetry for the Daily Titan, which, of course (allegedly), had been publishing low-quality poetry at the time. “We thought we could write poetry that was even worse but would sound better,” he said. They got three poems published before sending in “the most monstrous and terrible poem anybody’s ever written,” and they were asked to stop, Blaylock said. The free exhibit is open Monday to Thursday from noon to 4 p.m. and Saturdays from noon to 2 p.m. until May 10. 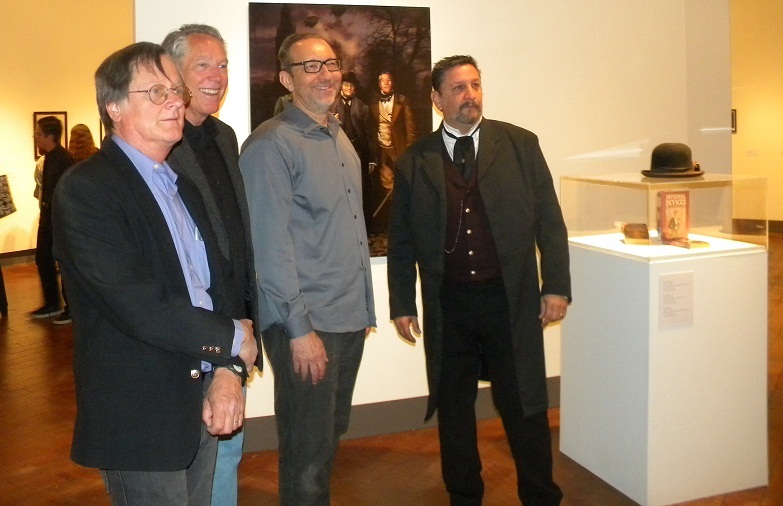 From left: CSUF alumni and authors Tim Powers and James Blaylock with Mike McGee (curator of the Begovich Gallery) and Cliff Cramp (art professor).